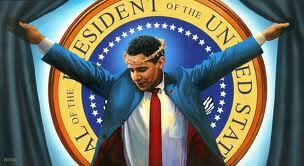 Trayvon Replaces Christ In Church Nativity | Stop Obama Now!! That oppressed blacks, who rebel, are “Christ” and the manifestation of God on Earth is a basic principle of Black Liberation Theology. Other black nationalist cult religions, such as the Nation of Islam, have similar doctrines, so this supremacist idea is rather widespread. Non-black, progressive, cult-religious, liberation doctrines, based on social justice, can include a compatible concept about the “oppressed” being literally the manifestation of God on earth. Such doctrines are frequently infiltrated into otherwise traditional Christian churches, as appears to have happened with this display at a Methodist church. With respect to traditional Christianity this display would be blasphemous. It projects the cult religious belief that man is God or can exalt himself to divinity status. This idea comes from the gnostic occult and not from traditional Christianity. Traditional Christianity teaches the opposite that Christ was uniquely divine, not just a template for other would-be “gods”. 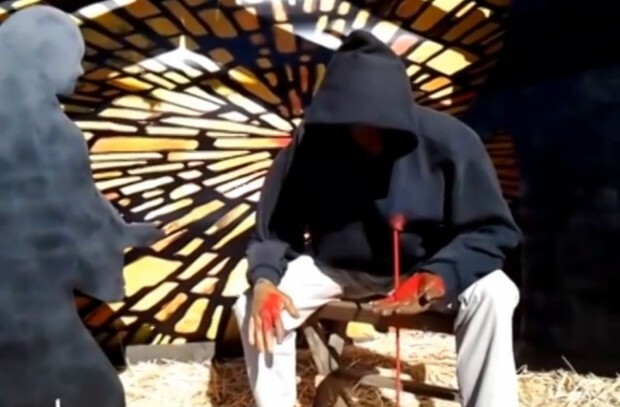 The artist of this nativity scene is white, but he is portraying the beliefs of black nationalists and black liberationists. Black Liberation theology teaches that white society represents the Antichrist and individual whites can be only be redeemed by “becoming black”, that is, total submission to the gods of black power, such as Obama. Cult religious beliefs can have a huge impact, even on pathologically narcissistic presidents. For white people, God’s reconciliation in Jesus Christ means that God has made black people a beautiful people; and if they are going to be in relationship with God, they must enter by means of their black brothers, who are a manifestation of God’s presence on earth. The assumption that one can know God without knowing blackness is the basic heresy of the white churches. They want God without blackness, Christ without obedience, love without death. What they fail to realize is that in America, God’s revelation on earth has always been black, red, or some other shocking shade, but never white. Whiteness, as revealed in the history of America, is the expression of what is wrong with man. It is a symbol of man’s depravity. God cannot be white, even though white churches have portrayed him as white. When we look at what whiteness has done to the minds of men in this country, we can see clearly what the New Testament meant when it spoke of the principalities and powers. To speak of Satan and his powers becomes not just a way of speaking but a fact of reality. When we can see a people who are being controlled by an ideology of whiteness, then we know what reconciliation must mean. The coming of Christ means a denial of what we thought we were. It means destroying the white devil in us. Reconciliation to God means that white people are prepared to deny themselves (whiteness), take up the cross (blackness) and follow Christ (black ghetto). To be sure, this is not easy. But whoever said the gospel of Christ was easy? Obedience always means going where we otherwise would not go; being what we would not be; doing what we would not do. Reconciliation means that Christ has freed us for this. In a white racist society, Christian obedience can only mean being obedient to blackness, its glorification and exaltation. From page 151 from the same book. Therefore, God’s Word of recon­ciliation means that we can only be justified by becoming black. Reconciliation makes us all black. Through this radical change, we become identified totally with the suffering of the black masses. It is this fact that makes all white churches anti-Christian in their essence. To be Christian is to be one of those whom God has chosen. God has chosen black people! You can find more excerpts from this and other books by Cone from this page.